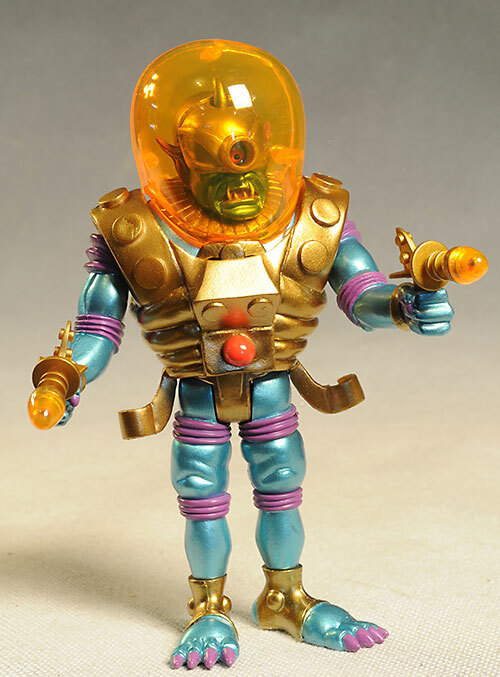 The Outer Space Men was a terrific line of bendy action figures from the far away days of the 1970's. They played on the popularity of space and science fiction themes during this period, much like Major Matt Mason. Flash forward to a couple years ago, and the Four Horsemen. They picked up the license to create new figures based on the old line, changing them from bendy to the Glyos body system and dropping the scale down to around 4". One of the latest releases in the series is a 'deluxe' figure, who is larger than the regular line. His name is Cyclops, and as you'd expect, he has one eye. But he has so much more than that! You can pick him up at the Store Horsemen right now as part of a three figures set (the other two figures are the wave 5 set) for $50. 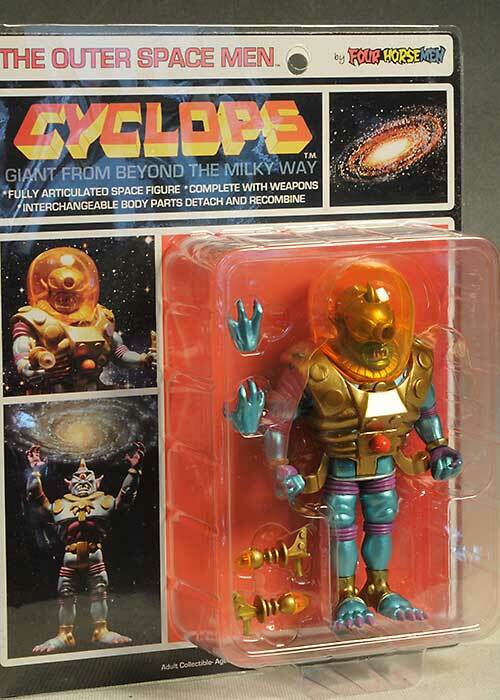 I love the retro 60's space toy look of the packaging. They've captured that period just about perfectly, and there's no waste or excess. I also appreciate that these are truly collector friendly, something very rare with bubble/cardback packages. The bubble edges are turned over to hold the backer in place, but it can easily be slipped out without any damage. There's one annoying twisty tie, but that's a small price to pay, and you don't need to replace it. 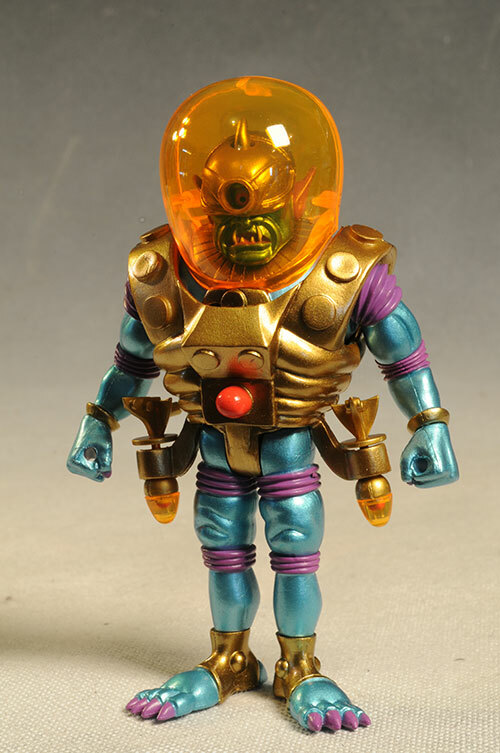 I really love the design on this figure - he's one of my favorite of the Outer Space Men now. 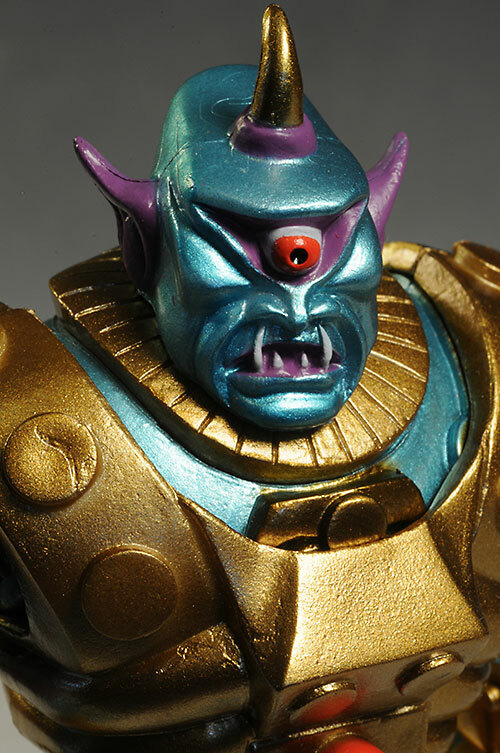 He captures the Cyclops look and gives him just the right touch of space alien to make the overall design work. There's some nice small details, especially on the face, and the sharp, angular lines of the spacesuit contrast nicely with the rounded helmet. Adding in the soft plastic holsters on either hip for the ray guns is another nice touch, allowing you to keep the guns with him at all times, even when using the open hands. This guy is taller than the normal OSM release, coming in at a full 5 1/2 inches. He stands great on his own, and all the hand sculpts look terrific in various poses. While I love the sculpt, I have to note that some of the paint isn't as clean as it could be. Smaller details, like the teeth, have soft, messy edges, and some of the gold armor is a bit inconsistent in coverage. There's not a ton of details either, making it more critical that the few that are here are done as nicely as possible. Considering the higher price point on this guy, and the general collector focus, top quality is crucial. 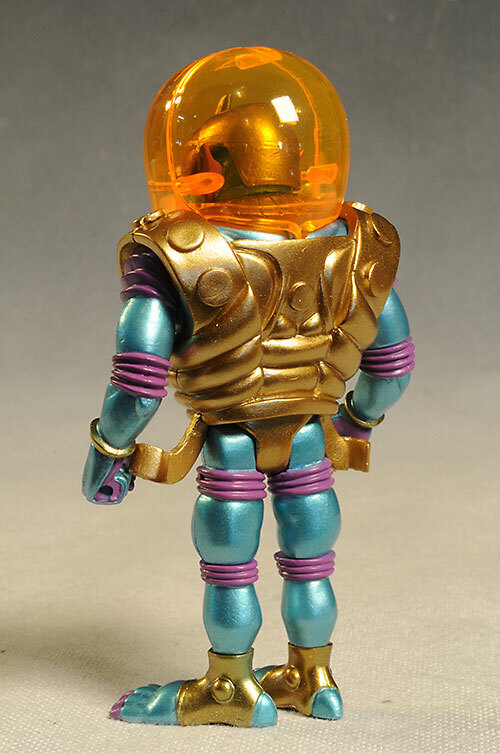 Outer Space Men are generally not super articulated, but they do have a good number of cut joints. Remember, these are designed to pop apart at every joint and allow you to customize them. There's a cut neck, cut shoulders, cut elbows, cut wrists, cut knees, cut ankles, cut waist, and T hips. As I said, these joints allow you to pop off various pieces and replace them with just about any other piece from any other OSM figure. That makes swapping hands easy, but you do have to be a little careful when posing the figure, since arms or legs can pop free and get lost. While all these joints are just cuts, they do allow for some decent posing (and the figure stands great on his own), and it allows for the customization. That's an acceptable trade off as far as I'm concerned. 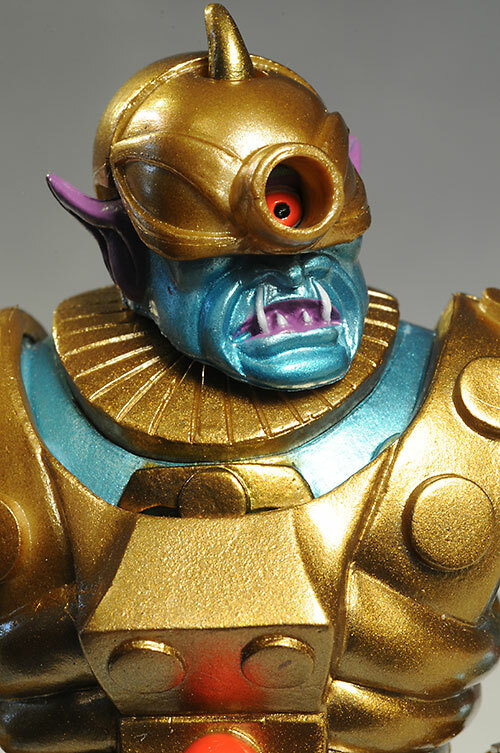 The Cyclops comes with a nice assortment of extras, particularly if you count the helmets that he comes with. There are two guns, which look great (I love the cool amber tip) and fit inside his fisted hands perfectly. They also fit inside the holsters on his hips, done in a futuristic style. We've seen these guns before, but they are still a good add for this character. He also has an extra set of posed hands, that look great and swap easily. As I said, there's also helmets here - two of them. The outer translucent helmet slips on and off without needing to be separated. It looks great, and it's large enough that you can move the head into any pose beneath it without hitting the cover. There's his second gold helmet that covers his bald pate and protects his single eye. This one pops off too, allowing you to see the full head of the alien. The gold horn is part of his head, not the helmet. While these aren't the most posable, they do have the fun customizing feature. Once you've acquired enough of the figures, you can make some of your own designs from all the parts. This figure comes as a set right now with the two smaller series 5 figures. The set of three is $50, and the smaller figures are usually $13 each. 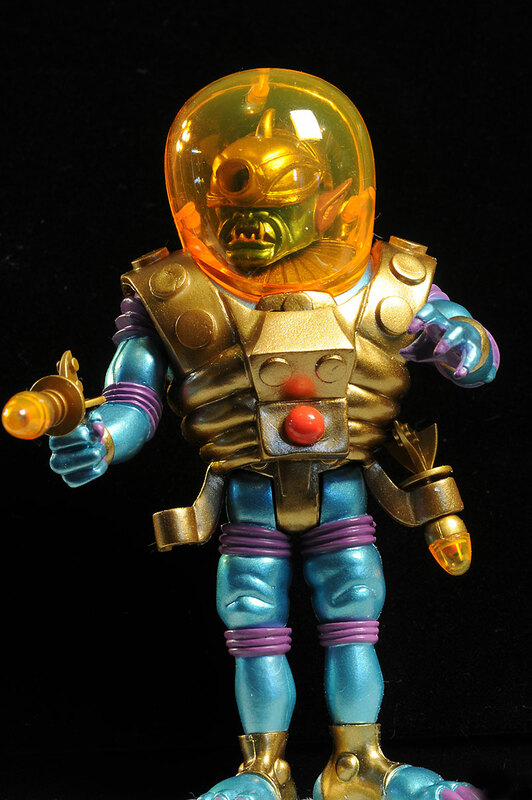 That makes this guy a whopping $24, which is quite a bit for one of the Outer Space Men, even a larger one. 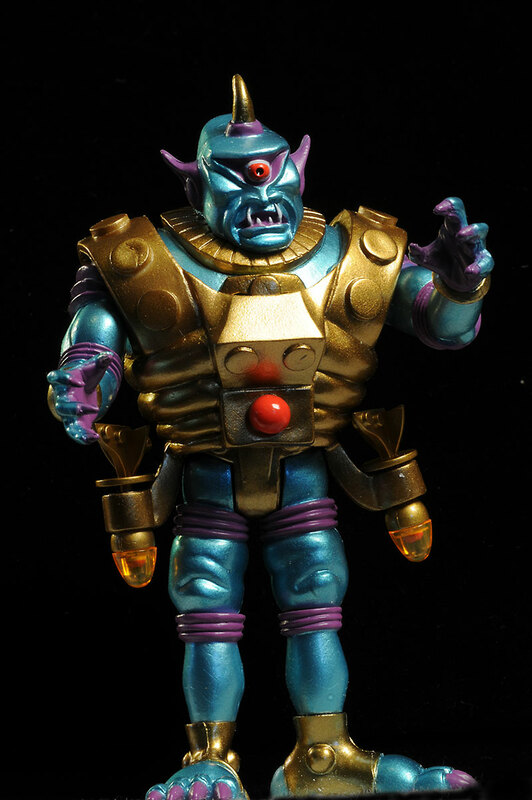 I really like this guy - he's a terrific addition to the retro style science fiction figures of OSM. His increased bulk sets him apart, adding even more diversity to an already very diverse series. His price tag is a bit of a problem, but perhaps once he starts shipping in quantity you'll be able to pick him up on his own at a better price. I also wish the paint were a little cleaner, but the customizing nature of the figure makes up for some of the minor nits. I also have the two series 5 figures here, and I'll be covering them in the next week. If you're a fan of the series, keep an eye out for that! You can get always get them direct from the Four Horsemen right now, or you can search ebay for a deal. 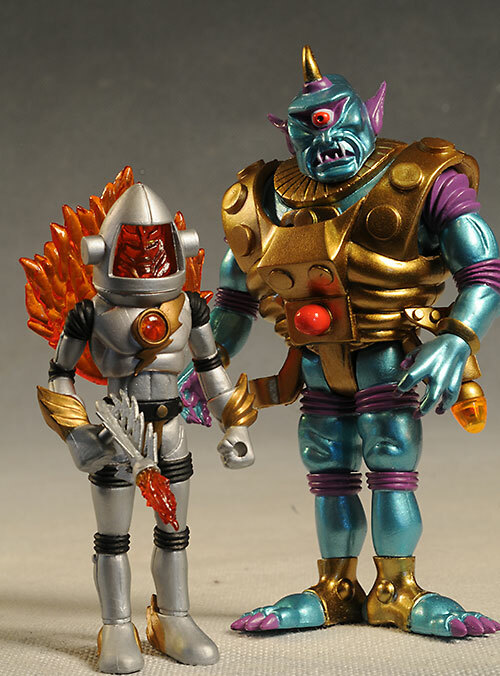 I've checked out some of the smaller Outer Space Men in the past, and I'll be doing some more of wave 5 very soon. And if you want a lot of cool information on both the old series and the new, check out the Outer Space Men Annex.